"A321" redirects here. For the British road, see A321 road. The Airbus A321 is a member of the Airbus A320 family of short- to medium-range, narrow-body, commercial passenger twin-engine jet airliners. [b] The first derivative of the baseline A320, it has a stretched fuselage and entered service in 1994 with Lufthansa, around six years after the original A320. The aircraft shares a common type rating with all other Airbus A320 family variants, allowing existing A320 family pilots to fly the aircraft without the need for further training. In December 2010, Airbus announced a new generation of the A320 family, the A320neo (new engine option). The similarly lengthened fuselage A321neo variant offers new, more efficient, engines, combined with airframe improvements and the addition of winglets (called Sharklets by Airbus). The aircraft delivers fuel savings of up to 15%. The A321neo carries up to 236 passengers, with a maximum range of 4,000 nmi (7,400 km; 4,600 mi) for the long-range version when carrying no more than 206 passengers. Final assembly of the aircraft takes place in Hamburg, Germany, or Mobile, Alabama. As of 31 January 2019, a total of 1,850 Airbus A321 aircraft have been delivered, of which 1,827 are in service. In addition, another 2,241 airliners are on firm order (comprising 81 A321ceo and 2,160 A321neo). 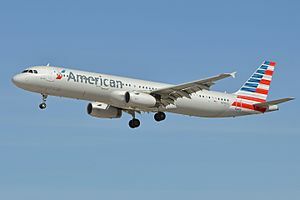 As of January 2019, American Airlines was the largest operator of the Airbus A321, operating 220 aircraft. The Airbus A321 was the first derivative of the A320, also known as the Stretched A320, A320-500 and A325. Its launch came on 24 November 1988, around the same time as the A320 entered service, after commitments for 183 aircraft from 10 customers were secured. The maiden flight of the Airbus A321 came on 11 March 1993, when the prototype, registration F-WWIA, flew with IAE V2500 engines; the second prototype, equipped with CFM56-5B turbofans, flew in May 1993. Lufthansa and Alitalia were the first to order the stretched Airbuses, with 20 and 40 aircraft requested, respectively. The first of Lufthansa's V2500-A5-powered A321s arrived on 27 January 1994, while Alitalia received its first CFM56-5B-powered aircraft on 22 March 1994. The A321-100 entered service in January 1994 with Lufthansa. 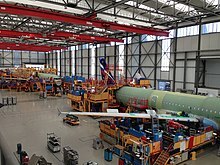 Final assembly for the A321 was carried out in Germany (then West Germany), a first for any Airbus. This came after a dispute between the French, who claimed that the move would incur $150 million (€135 million) in unnecessary expenditure associated with the new plant, and the Germans, who claimed that it would be more productive for Airbus in the long run. The second production line was located in Hamburg, which later produced the smaller Airbus A319 and A318. For the first time, Airbus entered the bond market, through which it raised $480 million (€475 million) to finance development costs. An additional $180 million (€175 million) was borrowed from European Investment Bank and private investors. The A321 is the largest variant of the A320 family. The A321-200's length exceeds 44.5m, increasing maximum takeoff weight to 93,000 kg (205,000 lb). Wingspan remained unchanged, supplementing various wingtip devices. Two suppliers provided turbofan engines for the A321: CFM International with its CFM56 and International Aero Engines with the V2500 engine, both in the thrust range of 133–147 kN (30,000–33,000 lbf). The Airbus A321 is a narrow-body (single-aisle) aircraft with a retractable tricycle landing gear and is powered by two wing pylon-mounted turbofan engines. It is a low-wing cantilever monoplane with a conventional tail unit having a single vertical stabilizer and rudder. Changes from the A320 include a fuselage stretch and some modifications to the wing. The fuselage was lengthened by a 4.27 m (14 ft 0 in) plug ahead of the wing and a 2.67 m (8 ft 9 in) plug behind it, so that the A321 is 6.94 metres (22 ft 9 in) longer than the A320. The length increase required the overwing window exits of the A320 to be converted into door exits and repositioned in front of and behind the wings. To maintain performance, double-slotted flaps and minor trailing edge modifications were included, increasing the wing area from 124 m2 (1,330 sq ft) to 128 m2 (1,380 sq ft). The centre fuselage and undercarriage were reinforced to accommodate the increase in maximum takeoff weight of 9,600 kg (21,200 lb), taking it to 83,000 kg (183,000 lb). The original derivative of the A321, the A321-100, featured a reduction in range compared to the A320 as extra fuel tankage was not added to the initial design to compensate for the extra weight. The maximum takeoff weight (MTOW) of the A321-100 was increased to 83,000 kg (183,000 lb). The A321-100 entered service with Lufthansa in 1994. Only about 90 were produced. Airbus launched the heavier and longer range A321-200 development in 1995 which has a full-passenger transcontinental US range. This is achieved through higher thrust engines (V2533-A5 or CFM56-5B3), minor structural strengthening, and an increase in fuel capacity with the installation of one or two optional 2,990 L (790 US gal) tanks in the rear underfloor hold. The additional fuel tankage increases the total capacity of this model to 30,030 L (7,930 US gal). These modifications also increased the maximum takeoff weight of the A321-200 to 93,000 kg (205,000 lb). This variant first flew in December 1996, and entered service with Monarch Airlines in April 1997. Its direct competitors include the 757–200 and the 737-900/900ER. On 1 December 2010, Airbus launched the A320neo family (neo for New Engine Option) with 500 nmi (930 km) more range and 15% better fuel efficiency thanks to new CFM International LEAP-1A or Pratt & Whitney PW1000G engines and large sharklets. The lengthened A321neo prototype made its first flight on 9 February 2016. It received its type certification on 15 December 2016. The first entered service in May 2017 with Virgin America. In October 2014, Airbus started marketing a longer range 97 t (214,000 lb) maximum takeoff weight variant with three auxiliary fuel tanks with 100 nmi (190 km) more operational range than a Boeing 757-200. Airbus launched the A321LR (Longer Range) on 13 January 2015 with a Range of 4,000 nmi (7,400 km) with 206 seats in two classes. On 31 January 2018, it completed its first flight. Airbus announced its certification on 2 October 2018. On 13 November 2018, Arkia received the first A321LR. In January 2018, Airbus was studying an A321LR variant with a further increased MTOW. The proposed A321XLR with a range extended to 4,500 nmi (8,300 km) would be launched in 2019 to enter service in 2021 or 2022 to compete with the Boeing NMA. In November, Airbus indicated that the A321XLR would have an MTOW over 100 t (220,000 lb) and 700 nmi (1,300 km) more range than the A321LR. As of 31 January 2019, 1,827 Airbus A321 aircraft were in service with more than 100 operators. American Airlines and China Southern Airlines operate the largest A321 fleets of 220 and 116 aircraft respectively. For the Airbus A321, 31 aviation accidents and incidents have occurred, including four hull-loss accidents / criminal occurrences with a total of 377 fatalities as of October 2017. ^ a b c d e "Airbus Orders & Deliveries". Airbus. 31 January 2019. Retrieved 23 February 2019. ^ "New Airbus aircraft list prices for 2015". Airbus (Press release). 13 January 2015. Archived from the original on 16 November 2016. Retrieved 17 November 2016. ^ a b c d "A321 specifications". Airbus. ^ a b "Specifications Airbus A320". Airbus. Retrieved 13 February 2012. ^ Moxon; Julian (17 March 1993). "A321: Taking on the 757". Flight International. Retrieved 25 February 2011. ^ "Airbus A321-100 Production List". www.planespotters.net. Retrieved 16 September 2017. ^ "Airbus offers new fuel saving engine options for A320 Family" (Press release). Airbus. 1 December 2010. ^ "Airbus A321neo completes first flight after engine switch". Reuters. 9 February 2016. ^ "Airbus A321neo with P&W engines receives Type Certification" (Press release). Airbus. 15 December 2015. ^ Aaron Karp (20 April 2017). "Virgin America receives first A321neo as Alaska mulls future fleet". Air Transport World. Aviation Week. ^ "Exclusive: Airbus launches "A321neoLR" long range to replace 757-200W". Leeham News. 21 October 2014. ^ "Airbus Launches Long-Range A321neo". Aviation International News. 13 January 2015. ^ "Airbus Launches Long-Range A321neo Version". Aviation Week. 13 January 2015. ^ "Airbus A321LR long-range jet completes maiden flight". Reuters. 31 January 2018. ^ "EASA and FAA certify long-range capability for A321neo" (Press release). Airbus. 2 October 2018. ^ David Kaminski Morrow (13 November 2018). "Arkia chief: A321LR first single-aisle to beat 757-300 economics". Flightglobal. ^ Jens Flottau (31 January 2018). "Airbus Studying Higher-Capacity A321neo". Aviation Week Network. ^ "Airbus indicates A321XLR would have over 100t MTOW". Flightglobal. 13 November 2018. ^ Airbus A321 occurrences. Aviation Safety, 3 October 2017. ^ Airbus A321 hull-loss occurrences. Aviation Safety, 3 October 2017. ^ A321 accident statistics. Aviation Safety, 3 October 2017. ^ "Airbus Family figures" (PDF). Airbus. July 2017. ^ a b "All About the Airbus A320 Family". Airbus. 2009. ^ "Airbus Studies 236-Seat A321". Aviation Week. 10 December 2012. ^ "Airbus reveals new A321neo layout: New 'Cabin-Flex' and larger doors". Australian business traveller. 13 June 2014. ^ a b "A321 aircraft characteristics - airport and maintenance planning" (PDF). Airbus. 1 February 2019. ^ a b c d "Type Certificate Data Sheet" (PDF). EASA. 22 February 2019. ^ "Airbus A320neo Technology". Airbus. Wikimedia Commons has media related to Airbus A321.